If you're currently looking for one of the best gaming monitors on the market today then this is the guide for you. We're massive PC gamers here at T3.com and, as such, we've gathered together ten of the absolute best gaming monitors you can buy right now to make it easy for you to find the tech that is best suited to you. And now's a great time to pick up a premium gaming panel for two big reasons. Firstly, gaming monitors have improved markedly over the past couple of years, with HDR (high dynamic range) beauties to curved, ultra-wide displays delivering some of the most sought-after features currently available on the market. Secondly, now is also a great time to upgrade your gaming monitor as the new year 2019 sales are now underway, and they are causing gaming monitor retailers to reduce their prices significantly. As such, there are some really, stupidly attractive gaming monitor deals going right now. Of course, choosing a great gaming monitor is not easy, with a glut of new specifications and features to comprehend, as well as brands and jargon to navigate. This can lead to situations where even die-hard gamers can sometimes find it hard to discern the attributes and add-ons that are best suited for their gaming needs. That's why we've laid out everything you need to know in his handy best gaming monitor guide. If, however, you just want an instant recommendation, rather than a list of potential gaming monitors to browse through, then we consider the Acer Predator XB271HU to be the best gaming monitor on the market right now. Compatible with Nvidia's killer G-Sync feature, the Acer Predator is simply a cracking gaming display, and it retails at a very affordable price point, too. There are, however, plenty of other top gaming monitor options from Asus, Samsung, BenQ, Dell, and more, so read on for some excellent recommendations at a wide variety of price points. Before we get to the list of best gaming monitors on the market today, though, we've supplied some concise advice and buying tips that will help you narrow down your next monitor. PCs are the pioneer when it comes to gaming graphics, but it doesn't matter how good your graphics card is if you don't have a monitor that can keep up with all those pixel-pushing improvements. And be under no illusion, if you want to get serious about your gaming you need more than just a beefed up hard drive. You need a good a screen - after all, that's what you'll be staring at. Naturally, a great gaming monitor has to look good, but most importantly it has to give you the specs that can give you a jump on your opponents: quick refresh rates, high picture quality and those all-important slick response times. The monitors that follow have these qualities and plenty more besides. Most important, though, is response time (listed in ms) and low input lag. Response time is how long it takes a pixel in your LCD to change colour. After all, one of the main requirements for a gaming monitor is the ability to handle fast-paced action. And, lastly, make sure you get a gaming monitor that comes with ports, modes, and connectivity options that you'll ideally want to use. It's no good spending money on a quality gaming monitor only to find out it doesn't have a specific input or auxiliary function you need. Offering excellent gaming performance, the 27-inch Acer Predator XB271HU is compatible with Nvidia's killer G-Sync feature, which smooths gaming by synching the monitor's refresh rate with the GPU. In other words, if you have a PC equipped with one of Nvidia's GTX graphics cards, you'll get silky smooth gaming at up to 144Hz (compared to the regular 60Hz that most monitors are capable of). The difference is astounding. Whether you're gaming or undertaking productivity work, colours look vibrant on the XB271HU's IPS panel, which also boasts excellent viewing angles. Asides from this gaming monitor only delivering a Full HD 1,920 x 1,080 resolution rather than something a little higher and more exotic, there really isn't really anything else to dislike. You get a rock solid 27 inches of screen to play on, which boasts a lush 1800R curve too, a high 144Hz refresh rate with Adaptive Sync and Free Sync for a super smooth gaming experience, and a varied selection of ports including DisplayPort, HDMI and DVI, too. As it is a monitor geared towards gamers, you also get a pretty darn powerful LED lightning system, including a very bright downward firing base projection. A really futuristic and weighty stand with swivel, tilt, and height adjustability complete a very attractive package. The successor model to the CG318-4K, Eizo's latest incarnation takes an already incredible DCI-4K package to an even higher level by adding in even more features to the mix. That 4096 x 2160 DCI-4K resolution comes with HDR gamma support as standard, so its 31-inch display as well a providing a very crisp and visually-arresting gaming experience, can also provide a cutting edge canvas for those working in professional video editing. It includes PQ (perceptual quantization) and HLG (hyper-log gamma), which work with those optimised gamma curves to render a true image on-screen. Ideal for those editing HDR video content in a post-production setting, the CG318-4K comes with a set of sensor wings as well, which fit around the top and side of the display, and it can self-optimise in order to create the truest representation of your footage. It's a very high-end model for very high-end use, hence the considerably high price point. But if video post-production is your bread and butter, and you also are a keen PC gamer, too, then this model is the best gaming monitor going today. At over £3,000 the Dell UltraSharp UP3218K is quite insanely expensive, but when you look at what it delivers, that price suddenly seems more apt. That's because the UP3218K is a 8K resolution monitor that not only delivers jaw-dropping fidelity and crispness, but also some of the highest quality colour reproduction available on any monitor. Naturally, because it is Dell, build quality is also superb. Obviously it isn't for everyone, the price largely sees to that, but if you've got the cash and the gaming setup to deal with outputting games at a resolution of 7,680 x 4,320, then this is the monitor for you. When it comes to 1080p 144Hz gaming monitors, ViewSonic has already made plenty of noise with the already impressive XG2402. But, in true monitor manufacturing form, the American firm is back at it again with an even better display offering - the Elite XG240R. It's not a huge overhaul, with much of the same features as the previous model in residence, but the additions are welcome ones and serve to make an already impressive formula that bit better. Which is interesting in itself considering this is a TN model, rather than an IPS or VA panel. Even without the colour depth or contrast of a VA, the XG240R has a super swift 1ms response time so your on-screen gaming is always going to have the best technical experience. When coupled with Adaptic-Sync, that 144Hz refresh rate and a 1,000:1 contrast ratio, this 24-inch display really performs really well. Colours are rich, blacks are deep and with a selection of viewing modes to choose from, it's often incredibly easy to get the best out of your current setup and game. Some of the biggest changes comes in the XG240R's physical design. ViewSonic has gone for more of a 'stealthy' look this time around, replacing the red of the XG2402 with an all-black look that helps the thick bezels blend in with the rest of the monitor. The mixture of matte black plastic and brushed-effect plastic make for a decent if not particularly striking combo, but the overall design is elevated by the two arrowhead LEDs at the rear of the model. The in-built menu system has also been given an overhaul of sorts, and it's a much more intuitive experience than the one shipped with the XG2402. Flitting between picture modes and adjusting image quality to suit the game you're playing and the console/PC you're playing on is so much easier. Again, the display itself isn't that far removed from the previous model, but with an adjusted responsiveness and an improved build quality, the XG240R is a quality and reliable display. Building on the already impressive performance and specs of the AOC Agon AG352UCG, the revamped and revitalised AOC Agon AG352UCG6 Black Edition comes out swinging with a improved refresh rate and those welcome ultra-wide angles. Sure, it's quite the outlay, but you're getting one of the best colour performances you can buy right now. Do your PC gaming setup justice and add this beast of a monitor to it today. For this money you rarely get a quality ultra wide panel, but that's what LG has managed with the 34UC79G. 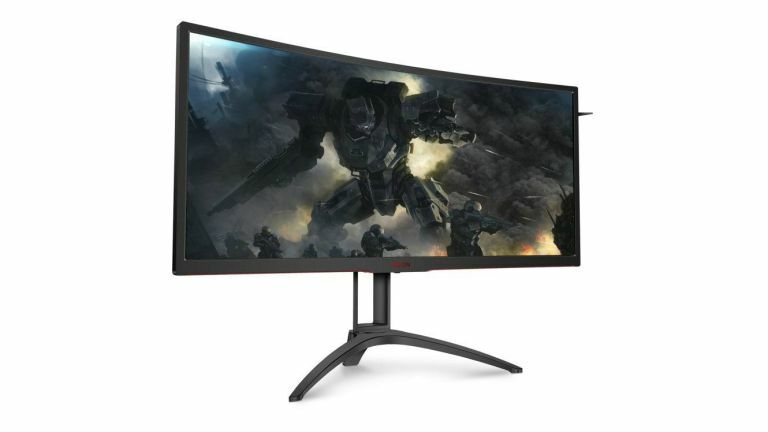 A 21:9, curved, 2,560 x 1,080 resolution display with AMD FreeSync (tech which eliminates tearing and stuttering), 1ms Motion Blur Reduction, 144Hz refresh rate, and rock solid stand that offers high levels of adjustability combine to produce a top draw monitor that, not 4K resolution aside, leaves very little to be desired. If you are looking to go ultra wide and don't have a premium-level budget, then this is the monitor for you. When it comes to gaming monitors, we know Asus knows how to do high-quality - and then some. The Asus ROG Swift PG27UQ continues this trend with a premium model that supports G-Sync and HDR for crisp colour performance and high 144Hz refresh rate, while offering a wide 4K UHD viewing experience. Yes, it'll put you in debt for the rest of your natural life, but you'll be doing the likes of The Witcher 3: Wild Hunt and Hitman an injustice without it. BenQ continues its run of good form in the world of gaming focused monitors with the EX3203R, which packs in a high refresh rate, a curved display and support for HDR. The latter ensures your gaming exploits have the brightest of colours and the deepest of contrasts for a vivid display on-screen. That 144Hz refresh rate offers a fluid performance, too, while the use of AMD FreeSync 2 technology eliminates choppy tearing and broken frames and ensures silky smooth gameplay. The EX3203R is also a looker, too, with a clean and minimalist aesthetic delivering a welcome dose of class. The BenQ EX3203R also comes with support for USB-C, enabling SuperSpeed USB data transfer and 2K video delivery on one cable. Regardless of your game of choice, this robust 32-inch display will ensure you're doing it justice, as well as deliver for you in terms of general use, too. Alienware may be one of the biggest and most formidable names in gaming laptops, but it’s also proving a brand to be reckoned with in the world of gaming-focused monitors. The AW3418DW features a powerful 120Hz refresh rate, the highest you can get right now in the ultra-wide range, and with a lightning-fast 4ms response time this 21:9 display makes for one powerful monitor for all your PC gaming needs. It comes with NVidia G-Sync as standard, which helps reduce screen-tearing, and four customisable lighting zones for that extra layer personalisation (this is Alienware after all). The 35-inch Agon AG352UCG from AOC comes with plenty of big features to keep rubbing shoulders with the biggest names in gaming displays. For a start, you get an impressive 3440 x 1440 resolution, a silky smooth 100hz refresh rate and a 4ms response time. Its 21:9 aspect ratio has the support of Nvidia G-Sync so you’re games won’t tear when they’re pumping away on ultra settings, making it ideal for use with competitive titles such as Overwatch or League of Legends (where even the slightest amount of lag can mean victory of a painful loss). While the BenQ PD3200U wasn't designed with gaming specifically in mind - it's actually geared towards the graphic design market, and boasts software aimed at this niche set of consumers - it's still a fine way to add an affordable 4K UHD monitor to your PC gaming setup. BenQ will also calibrate its settings to your specifications before it ships, ensuring it's ready to plug in and make the most of as soon as it's out of the box. Best 4K monitors: which is the top Ultra HD monitor?